We express our greetings of brotherly love to Your Holiness, with a prayerful heart and a joyful soul. United in our joy today are the clergy and faithful sons and daughters of our Holy Church who have come together from throughout the world. We offer gratitude to the Almighty in heaven, as successor to Saints Thaddeus and Bartholomew, and the saint co-equal to the apostles, Gregory the Illuminator, that we are enjoying the light of this good day when we exchange the divinely ordained kiss of peace with Your Holiness, worthy successor to the See of Saint Peter, seven years after experiencing the joy of receiving your predecessor of blessed memory under the gaze of biblical Mount Ararat. It is even more joyous that this kiss of peace is exchanged on this day, the 9th of May, when we are celebrating Victory and Peace Day in our homeland – the day which commemorates the conclusion of World War II – the cause of great human tragedy and misery; as well as the triumph of our people in the national liberation struggle for Mountainous Karabagh. We come from an ancient land, where the first Christian state was born through the evangelization of the Holy Apostles, and where the faith was never vanquished. Our people bowed their heads and kneeled down before the divine love and hope of salvation, and overcame manifold difficulties and tragedies through the power of the Cross of Jesus Christ, believing that “…we suffer with Him, in order that we may also be glorified with Him.” Romans 8:17. Truly, our Christian history itself became like the life of Christ, and its pages are living readings of the Gospel. Praise and thanks to God in heaven, that the testimony of fidelity on the part of our small nation, was crowned with victorious glory and worthily decorated our lives, making us God’s own people. Our nation became recipients of the Lord’s grace once again when the flag of independence was raised over our homeland. Through the light of the Savior’s resurrected life, our people – in spite of the ongoing illegal blockade by neighboring countries and countless external and internal challenges, are living in spiritual renaissance and with their new hopes of an indivisible life. Today, we have the happy opportunity to convey to Your Holiness the greetings and best wishes of the new president of the Republic of Armenia, Serzh Sargsian, who is investing his efforts to deliver the expectations of a better quality of life for our people, and to lead the country on the continued path of democracy and development. We also bring with us the greetings of all our sons and daughters, of a reinvigorated Diaspora, and of a free and self-determined Republic of Nagorno Karabagh, the international recognition of which shall be achieved, through the Will of God and the assistance of humanitarian and righteous governments. Dear Brother in Christ, through the blessings of our Lord’s All-Provident Right Hand, we stand alongside one another today, to strengthen and testify to the fraternal love between our two Churches. Faithful to the holy Church fathers and their legacy, despite our differences and unique characteristics, we shall place greater importance on that which unites us. 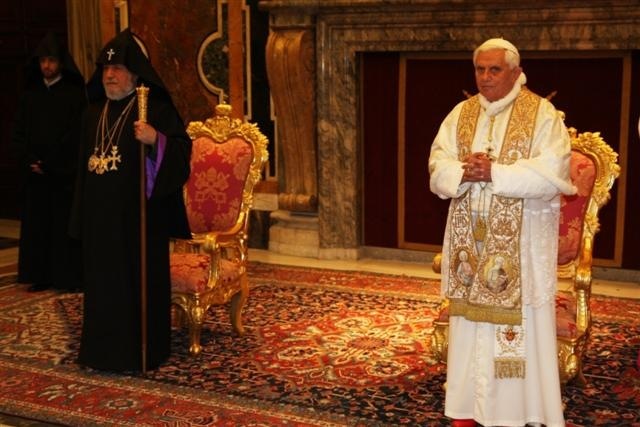 It is especially pleasing for us to confirm that the spirit of love and collaboration between the Armenian and Catholic Churches finds its tangible expressions in our time, confirming the words of the psalmist: “Behold how good and pleasant it is for brothers to dwell together in unity!” Psalms 133:1. Expressions of that fraternal and kind attitude can be found here in the Vatican itself, through the erection of the statue of the Illuminator of the Armenians – our patron Saint Gregory; and the naming of the plaza after the great saint, as well as the use of the Church of San Biagio, a historic site of prayer for Armenian pilgrims, made available once more to the Armenian community of Rome. We extend our thanks to you, and through you, to the Catholic Church, for the courtesies and assistance afforded to the Armenian people. The love received from our Lord Jesus Christ bears much good fruit in the field of ecumenism today. We welcome the ongoing dialogue between the Catholic Church and the family of Ancient Oriental Orthodox Churches. In our present, fast-paced world where developments and changes rapidly occur, many environmental, social, political, economic, and moral issues urgently need attention, especially in the process of globalization, when true respect for life and man, and love for God, is diminishing. The greater consolidation of diligent efforts and partnership are an imperative for Christian Churches, because only through inclusive cooperation shall we be able to better serve the establishment of peace in the world and to better defend human rights, and the rights of nations, families, and those classes of society which are at-risk. The transfiguration of life through the values of the Gospel, shall be our path to the creation of a prosperous and virtuous world. Dear Brother in Christ, our soul joyfully responds to your call to action directed to the entire globe during your most recent pontifical visit, exhorting all who yield power, that instead of confrontation, violence and war; religions, nations and governments should choose the paths of dialogue and mutual understanding. Your vigilance aimed at strengthening Christian understanding, knowledge and instruction is dear to our hearts, as is your attentive care for educational institutions, so that the new generation of young men and women bear witness to our Lord Jesus Christ and Christian truths with a renewed spirit – through their actions, their deeds and their very lives. 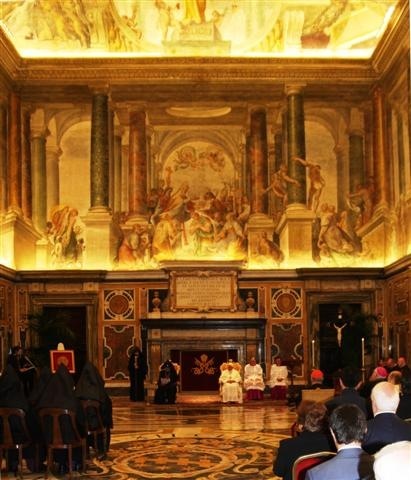 The plans and efforts of our Church are aimed at this same goal, where Your Holiness continues to support us, especially in the sphere of the preparation of clergymen. The spirit of fraternal love between the Armenian and Catholic Churches, and the results which we see today, encourage us to make our consolidated efforts more productive, for the sake of our one mission, whose guide and leader is Christ our Lord. It is with this optimism that we greet all servants and laity of the Catholic Church and bring our commendation and blessings to Vatican State Secretary, His Eminence Tarcisio Cardinal Bertone; to His Eminence Walter Cardinal Kasper, President of the Pontifical Council for Promoting Christian Unity; to your nuncio in the Southern Caucasus, His Excellency Archbishop Claudio Gugerotti, and to all those individuals through whose tireless efforts, bilateral relations between our two Churches and states continue to develop and progress with growing understanding and reciprocal respect. As we conclude our remarks, we extend to Your Holiness our invitation and the invitation of the President of the Republic of Armenia, to visit Armenia and the Mother See of Holy Etchmiadzin. We and all of our faithful people will always be happy to receive you in the spiritual center of all Armenians, where we shall offer our united prayers to our Lord heaven under the sacred arches of the Cathedral where Christ Himself descended. We pray that Almighty God grant many years of unshaken pontifical reign to Your Holiness, to make manifest all your visions and aspirations for the vibrancy of the Catholic Church and her faithful sons and daughters. We pray for our Lord Jesus Christ to keep and protect the entire world under His benevolent and watchful gaze, in love, solidarity, harmony and peace for His glory and for the welfare of mankind. The grace of the Lord Jesus Christ and the love of God and the fellowship of the Holy Spirit be with us and with all, now and always. Amen. Dear Brother in Christ, today, on the threshold of the Feast of Pentecost, when we unite our prayers to those of Your Holiness and of your faithful sons and daughters, we praise and glorify the Holy Spirit, Who is the fountainhead of unity and transforms our steps on the paths of brotherhood with grace – steps which are for the glory of God and are born from the love of Christ, for the sake of establishing peace in the world and a blessed life for mankind. In spite of different historical experiences and paths we have traversed; in spite of dogmatic and cultural divergences, we are all children of the one God, and we are all brothers and sisters in His Holy love. For in our diversity, it is our unity of love that is the genuine testimony that we are children of God. We Armenians are a people who have survived genocide, and we know well the value of love, brotherhood, friendship, peace and a secure life. Today, many countries of the world recognize and condemn the Genocide committed against the Armenian people by Ottoman Turkey, as did the Holy See, by His Holiness Pope John Paul II of blessed memory during our fraternal visit to Rome in 2000. Offering prayers to his luminous memory, we as Pontiff of the Armenians, appeal to all nations and lands to universally condemn all genocides that have occurred throughout history and those that continue through the present day, so that those who yield power and authority realize their responsibilities and results of those crimes which have been and continue to be committed against the creation of God, and that the denial of these crimes is an injustice that equals the commission of the same. May the love and grace of our Lord Jesus Christ be with us all, now and always. Amen.